“A singularly effective guide. Inspired concept. 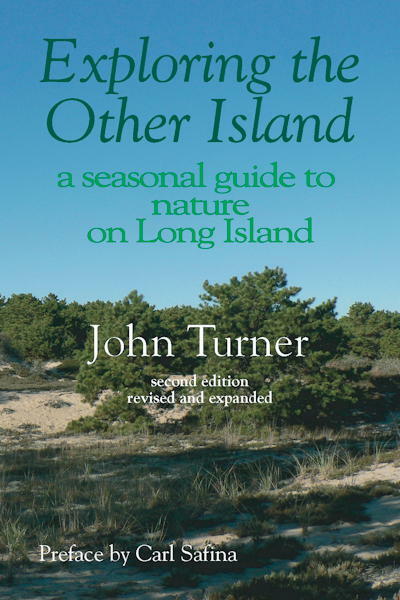 Highly recommended!” George Plimpton noted on the first edition of John Turner’s classic guide to the natural world of Long Island. Now Turner, one of New York’s most knowledgeable and eloquent naturalists, has produced a new edition, greatly expanded and thoroughly updated. With more than 80 photos by leading nature photographers and 24 line drawings by artist Maria T. Hoffman, the new edition offers a rich experience of the “Other” Long Island—the one far removed from the malls and highways, developments and office parks. It’s remarkable that so much of the natural world remains to explore in this limited space that is also home to nearly eight million people (as well the native fauna Turner so affectionately describes). Turner discusses nearly 300 species of flora and fauna that call Long Island home—an abundance that is due in no small part to the island’s unusually varied ecology. Exploring the Other Island offers 41 chapters and 14 additional essays divided by season. But it is also truly a guidebook. Each section concludes with notes on Where to see what has been discussed, and When. The Index of Species is a valuable reference. The Index of Locations lists a remarkable 116 local, county, state, and national parks and other destinations. If you find yourself, for example, in Caumsett State Park just turn to the Locations Index to discover what to look for. There are also four appendixes to guide you to further study.